Going Commando | A SWTOR Fan Blog: So what's the difference between beating Revan solo vs. in the operation? So what's the difference between beating Revan solo vs. in the operation? This is a question that has been on my mind at one time or another pretty much ever since I heard that Shadow of Revan was going to give you a separate option to complete its story line solo or in a group. What I didn't expect was that it would take me about four months to actually get the answer to that question from first-hand experience. I knew that the final solo fight was pretty horrifically bugged during Shadow of Revan's early access period, but I didn't expect the operations mission to be bugged as well - and to go unfixed for months. Specifically the problem was that the mission just wouldn't update for some people (including me), with no known workaround other than to try again the next week and see if it worked then. For me this was annoying in so far as I had chosen to experience the operations story path on one of my alts, and while I run ops pretty much every week, getting to do so on an alt is much rarer. I think it was finally on my fourth or fifth completion of Temple of Sacrifice on my Sage that I also received credit for "The Enemy Within" and was finally able to see the alternate ending. So... was it worth it? Both on a personal level to see both "versions" of the ending and on a development level to even make two different endings? Honestly, I'm not sure. First off it's worth mentioning that the actual ending is completely unaffected by your choice - the actual ending being the showdown with Revan on the Forgotten Terrace (the one that you can repeat as a weekly) and a solo mission, regardless of which path you choose. So effectively the only thing that's different is one of the missions that lead up to this ending, which require you to either complete Temple of Sacrifice once or to do a round of dailies. In hindsight it honestly feels like much ado about nothing. The operation is cool, but if you're the kind of person who enjoys running operations, you're going to do so with or without an extra quest to go there. Choosing the operations path also has the side effect that you're locked out of being able to do the dailies until you complete the ops mission, which was quite a nuisance, especially with the mission continuously bugging out and refusing to complete. In the end there isn't even much of a difference in terms of NPC reaction. I was hoping that if I chose the operations path (which officially means "personally leading a small strike team into the Temple") the very least I would get would be a hearty pat on the back from Satele Shan. Instead you get pretty much the same cut scene as when you choose the daily version, with the voice-over coming down to: "Good job with stopping Revan, now look at our forces 'securing' the Temple after you've already done all the work". Pfft. I think in the future I would advise Bioware not to bother with such a "dual path system" again. Even if you ignore all the bugs for a second, the solo/daily path was pretty much always going to be more convenient simply because it didn't halt all your progress until you could get an ops run together... and even if you like grouping up and running operations, you would be doing so with or without that mission, so that there's little reason not go for the more convenient solo path just to see the ending of the quest and to unlock access to the dailies. 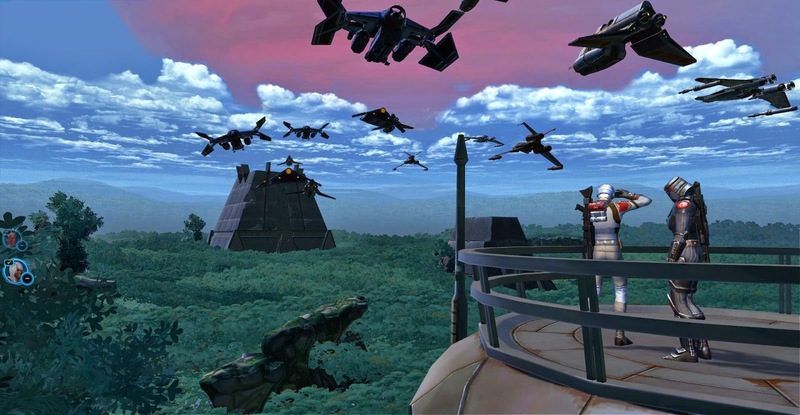 If you tried both story paths on Yavin 4, how did it work out for you? I think they included the dual path because they wanted an operation with Revan as the final boss. But then they realized that they needed to finish the story for solo players, so they put in the solo fight. (Probably because of the reaction to the Oricon storyline.) At that point things got weird. I think the real lesson here is that operation stories work best when they are separate from the solo stories. The solo story should be self-contained. Agreed on that. I thought the early operations stories worked well on their own, Dread Master appearances and all... it did get weird once they started "leaking" into the solo content though, which then made little sense without the operations background. I was confused by the group vs solo approach at the end of the Yavin chain as well. I initially picked the group option because, like you, I was looking forward to trying out the raid. But eventually I found out it was so much easier to just go with the solo option for the weekly that I've only done that afterwards (also, I first levelled up my sage but then was continuously asked to tank on my shadow for the raids, so that didn't exactly help with completing the raid-version of the weekly that I had picked up on my sage either).